Central London is a blend of history, culture and modernism. It’s where the present meets the past and where the tradition merges with the multiculturalism. It’s the perfect place to go and venture into a cultural journey that will help you discover one of the most spectacular cities in the world. Central London is a distinguishing area comprising a wide array of attractions, activities, institutions and professional bodies. It includes the metropolitan boroughs of Finsbury, Holborn, Westminster, the City of London, as well as the inner parts of St Pancras, Shoreditch, St Marylebone, Stepney, Paddington, Bermondsey, Kensington, Chelsea, Lambeth, and Southwark. A journey in UK’s capital city must definitely include a visit to Central London and to its world-famous landmarks. 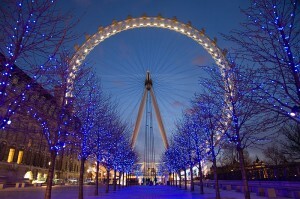 The London Eye will help you admire the best of this area. This giant Ferris wheel is located on River Thames banks and it measures 135 metres in height. It’s Europe’s tallest Ferris wheel and UK’s most popular tourist attraction. More than 3.5 million people visit it every year. Until the construction of The Shard (245-metre tall), the London Eye was the city’s highest viewing point. The London Eye was built in 1999 and throughout the years it received numerous names such as the British Airways London Eye, Millennium Wheel and Merlin Entertainments London Eye. From 2011, it’s officially known as EDF Energy London Eye. The structure is located between Hungerford Bridge and Westminster Bridge, near the Jubilee Gardens. The design of the London Eye was signed by seven architects: David Marks, Julia Barfield, Frank Anatole, Mark Sparrowhawk, Nic Bailey, Malcolm Cook and Steve Chilton. The wheel features 32 passenger capsules that can carry up to 25 persons. Each capsule weighs 10 tons and it is a symbol for every London Borough. The official opening of the London Eye took place in December 1999. It was opened by Tony Blair, the then Prime Minister. However, some technical problems postponed the opening until March 2000. Since 2005, the London Eye was used to host the New Year celebrations in London, including the 10-minute firework displays. From the top of the London Eye, you can get a 3600 panoramic view over the capital city. In order to get rail transport from London Heathrow Airport to Central London, you have to take the Heathrow Express to London Paddington and from there you can take the Underground service to Central London. There are also other transfer options such as using a taxi service from London Heathrow Airport or Paddington to Central London. So as to travel by car from London Heathrow Airport to Central London, you must take the A4 road and M4 motorway. London Heathrow Airport is 16.6 miles away from Central London. A journey by taxi from London Heathrow Airport to Central London with 247 Heathrow Airport Transfer is going to last around 50 minutes. The price for a taxi service from London Heathrow Airport to Central London starts from 43 GBP.